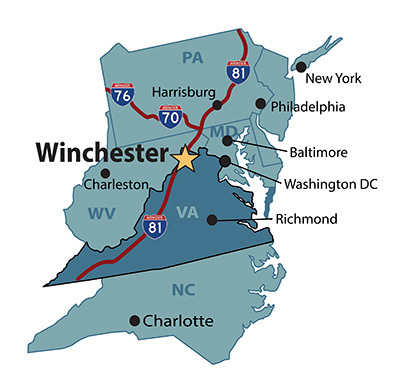 Winchester-Frederick County is located at the top of Virginia, only 72 miles northwest of Washington DC, 86 miles south of Gettysburg, PA, and 22 miles north of Shenandoah National Park. 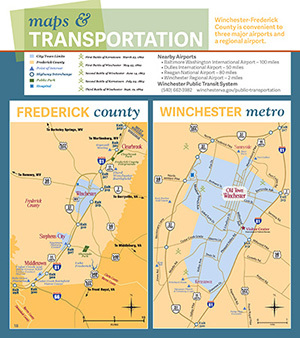 Seven major roadways – routes 11, 522, 340, 81, 7, 50, and 66 converge in Winchester-Frederick County. The area is situated within a 3-hour drive of 14% of the U.S. population. Need maps of the area? Fill out an information request to receive a Visitors Guide that includes maps, or download them below. 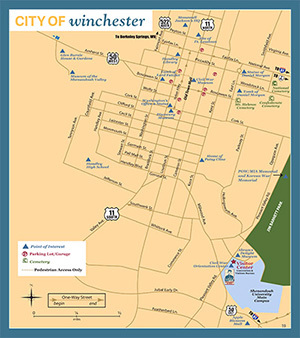 We also have a variety of local maps for free and to purchase at the Visitors Center, 1400 S. Pleasant Valley Road, Winchester. On-street parking, parking lots, and four parking garages offer ample parking in the downtown area. For details, visit winchesterva.gov/parking. From Washington, DC Take Route 66 West to I81 North, Exit 313. Turn right off the exit, keep right onto Millwood Avenue. Turn right onto Pleasant Valley Road. Visitors Center is on the right. From Dulles Airport Head east on Saarinen Circle. Continue onto Dulles Access Road. Take exit 9A toward Washington/Virginia 28/Virginia 267/U.S. 50/U.S. 7/Sterling/Centreville/Interstate 495. Keep right at the fork and merge onto VA-267 W. Take exit 1A on the left to merge onto US-15 S/VA-7 W toward Leesburg/Warrenton. Continue onto VA-7 W. Route 7 becomes Berryville Avenue in Winchester. Turn left onto Pleasant Valley Road. Visitors Center is approximately 1 mile on the left past Jim Barnett Park. From the North Take I-81 South to Exit 313. Turn right off the exit, keep right onto Millwood Avenue. Turn right onto Pleasant Valley Road. Visitors Center is on the right. From the South Take I-81 North to Exit 313. Turn right off the exit, keep right onto Millwood Avenue. Turn right onto Pleasant Valley Road. Visitors Center is on the right. From the East Take Route 50 West toward Winchester. Keep right as Route 50 becomes Millwood Avenue. Turn right onto Pleasant Valley Road. Visitors Center is on the right. Or, take Route 7 West toward Winchester. 7 West becomes Berryville Avenue. Turn left onto Pleasant Valley Road. Visitors Center is approximately 1 mile on the left past Jim Barnett Park. From the West Take Route 50 East toward Winchester. Route 50 becomes Amherst Street. Keep right onto Boscawen Street. Turn right onto Braddock Street. Turn left onto Millwood Avenue. Turn left onto Pleasant Valley Road. Visitors Center is on the right.